McDonald's, along with a bevy of other brands, paid tribute to International Women's Day with an alteration of its iconic golden arches. 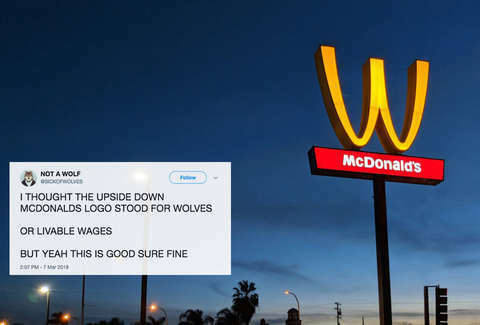 The company inverted its logo across social media channels, fashioning the golden M into a W, and one McDonald's outpost in California even went as far as to change the physical sign in front of its store. McDonald's has been tweeting its usual blither about burgers and fries today, mixing it up with inspirational stories for the occasion. Notice the golden arches are upside down (is it WcDonald's now?). This was all an effort to drum up support for International Women's Day, but McDonald's actions have bee criticized by people who say the purely symbolic gesture is lazy and tone-deaf. The bulk of the invective is rooted in the generally low wages paid to fast food service workers, which aren't likely to improve by virtue of a modified logo. I always enjoy #InternationalWomensDay the one day of the year when we have a female President, workplaces without harassment and universal paid maternity leave. Oh, we don’t get any of that? Well, thanks for turning the arches upside down, McDonalds. International Socialist Women's Conferences: Let us create a holiday celebrating women from a socialist perspective! "In celebration of women everywhere, and for the first time in our brand history, we flipped our iconic arches for International Women's Day in honor of the extraordinary accomplishments of women everywhere and especially in our restaurants." McDonald's logo will switch back to its normal orientation on Friday, although the vision of inverted arches are likely to live on for a while longer.